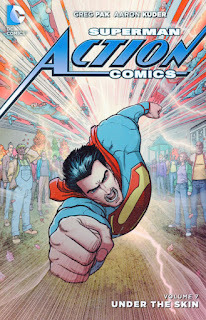 Superman: Action Comics Vol. 7: Under the Skin follows a similar pattern of the other Superman titles post-"Doomed" crossover. There's a bit of cleanup from "Doomed" here, but also a sense of marking time until "Truth" starts in the post-Convergence "DC You." Surely Greg Pak and Aaron Kuder are an inspired Superman team, turning out enjoyable and tonally appropriate Superman stories. But the main story, told in four issues, feels like something that might've been told in the Triangle Titles era in just two, and then the book's two closing one-shots equally lack much implication. Pak and Kuder have had three volumes so far, of which one was devoted to a crossover and this one feels interstitial, and then they only get one more before their run is done. That's a shame, because I think this is team that could have done something even more extraordinary given freer reign -- and the ability to actually work in Metropolis. Though Pak's output on Action Comics is not so much less in total volume, for instance, than Jeph Loeb's on Superman, in reading Under the Skin I find myself nostalgic for the days when not every story had to be written to trade size and smaller stories could indeed reap the benefits of just being smaller. Pak run feels written to the trade when I might have preferred to see what he might have done just plain writing. Much kudos here to Aaron Kuder, at the outset, who takes his friendly, animated style and manages to come up with convincingly gross and grotesque monsters for this horror tale. I believe horror is tough to do convincingly in flat-on-the-page comics, though Neil Gaiman did it in Sandman, and of late I can think of good examples from Gail Simone and Scott Snyder. Pak does it well enough here too, especially again in surmounting what has been he and Kuder's breezier, lighter-hearted Action Comics so far. Superman has an extended nightmare sequence in the third chapter that I thought the team did especially well, and Pak's conceit that Superman wears a beard after his post-"Doomed" space jaunt contributes; this looks like a harried, more unsure man, not quite Superman, and it created doubt that he might not triumph in the end. The defining attribute of Pak's Action run has been his inclusion of Lana Lang, and later Steel John Henry Irons. I intuit that this is Pak turning a limitation -- that he could not use Metropolis or Lois Lane, the realm of the Superman-title writers -- into an advantage, and he's given us a Lana more capable and better defined than she's been in years. Here, Pak has Lana reeling from the death of her parents and Superman's tangential role in that, and it makes Lana more passive -- the spurned friend -- than the active ally of Superman she's been so far. I'm happy for any spotlight of Steel as well, and I especially liked when Steel extended his metal suit to give Superman a steel suit of his own, but it seemed a step back for Lana to be the damsel in distress here when she previously fought Brainiac's robots in space or held her own against subterranean beasts. We're perhaps overdue for a Smallville story in the waning days of the New 52, given it factored somewhat regularly in pre-Flashpoint Superman stories and, with the newly established deaths of the Kents, now not at all. But again, it's four issues for Superman to discern that the townspeople have super-powers and a Phantom Zone monster has attacked. I'm reminded of that one issue where Psi-Phon and Dreadnaught came to Smallville or the two-parter when Superman and Robin Tim Drake saved Jimmy Olsen from vampires; this is a story with no more heft, maybe even less, and it seems drawn out to take up almost the whole book. Further, in the rush to the "DC You" change-over, Pak doesn't even establish whether Smallville remains full of telepaths; also, I appreciated that Pak tried to tie the story into DC lore, but the previously-established Ultra-Humanite is so different from this one that it came off just strange, not meaningful, to use the name here. Pak ends his regular run with a one-off Bizarro issue. After the last four issues' uncharacteristic horror, this issue feels like a return to form for Pak and especially Kuder, who gets to draw to his madcap strengths. Pak lampooning his own Superdoom storyline is fun, though I wish the ties to Pak's run had been stronger with Bizarro Lana and Steel appearances, not just Bizarro Lois and Metallo. Additionally, Pak's Bizarro story offers nothing new, for instance using a Bizarro Justice League visually pretty similar to Geoff Johns and Eric Powell's from Escape from Bizarro World (and there are no ties, if you're wondering, to Heath Corson's recent Bizarro miniseries). Sholly Fisch writes the "Five Years Later" Futures End tie-in issue included here; though not published after the book's last issue, it feels fitting to put it there since Fisch wrote so much backup from the beginning of the New 52 Action Comics with Grant Morrison. As with the rest of this book, there's nothing wrong with the writing of the story, a surprising tale of regular people getting Superman's powers, and I give any Futures End tie-in extra points for actually fitting within the pages of that series. In the issue's use of a sand Superman, I had been expecting some tie to the classic Superman "Sandman Saga"; we didn't get that, but Fisch penned a good one nonetheless. There's much talk these days of the New 52 Superman -- who he was, what his strengths were, how similar or different he was to the pre-Flashpoint Superman and what value the New 52 Superman had on his own. I like the lore that Pak sets up here, that Lana Lang left Clark Kent behind and not vice versa, and also I think Pak writes an effectively young Superman -- there was a "hell" in his dialogue toward the end and a "dammit" in fighting Bizarro that, while not the severest of curses, made me recognize this as a rougher Superman than the previous. I actually liked Scott Lobdell having Clark embarrassingly quit the Daily Planet because it differentiated the New 52 Superman as one still making mistakes. As Lobdell passed the torch to Pak (or would have been passing it, had Pak remained on the title and the whole thing not be upset by Rebirth), I think Suprman: Action Comics Vol. 7: Under the Skin has moments that continue to define the New 52 Superman -- rougher, maybe more uncouth, but hopeful and inspirational and surrounded by good friends. Again, nothing to offend a Superman fan here, I don't think, just more going on elsewhere and the needs of the greater story taking the wind out of Action Comics's sails a bit. I've been hearing the Triangle era of Superman a lot recently, but have no idea what that means. The "Triangle Titles" era of Superman roughly refers to the period from the end of John Byrne's run to the beginning of Jeph Loeb's (or, put another way, the Dan Jurgens/Jerry Ordway/Roger Stern/Karl Kesel/Louise Simonson period), in which the three/four/five Superman titles were interconnected and read like a weekly series. To help readers know the order to read them, the issue covers had a triangle with a number on them (supposed, I believe, to be a Superman shield, but ended up a triangle); as such this era with the numbered triangles is known as the "Triangle Title" era. The first "triangle title" was Superman #51. Stories in this era include "Krisis of the Krimson Kryptonite" (not numbered), "Panic in the Sky," of course "Death of Superman," and into things like "Trial of Superman" and "Death of Clark Kent," the wedding, and so on. The heyday of Superman in mine and others' opinions, and also, in reference to the review above, a time when the Superman books told good stories using a broad and consistent supporting cast and when the stories weren't padded more than they needed to be to tell the tale. Follow up: Can I ask when you started reading comics? Just curious how that coincides or not with the "Triangle Titles." I started reading comics in 2006/2007. I'd buy an issue here and there sporadically before then, but 06/07 was when I started collecting for real and paying attention to the different universes and what not. I actually haven't read a Superman comic until recently. I think my first exposure was Action Comics from the beginning of the New 52, then I tried again with Superman Rebirth and have been loving him, although I find his trades before Flashpoint a little confusing so I don't know too much about his history.